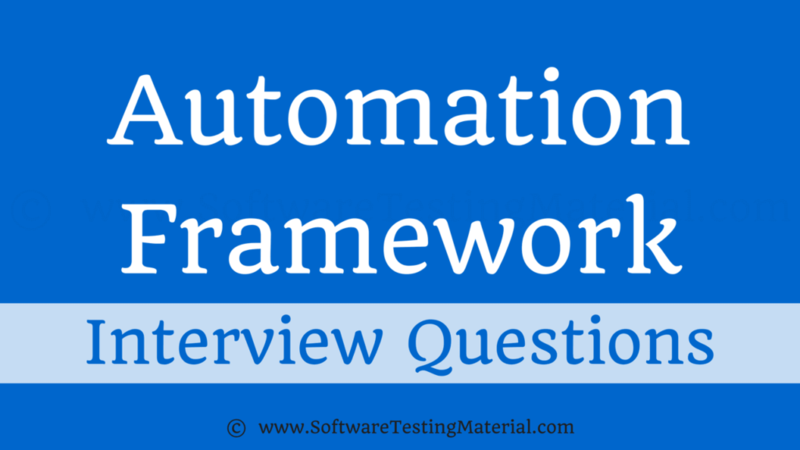 1) What is Automation Framework? Definition 2: A set of guidelines, assumptions and process developed by experts in order to perform a task(s) in an effective, efficient and optimized way. In one project test automation we create and use different types of files and we perform different types of tasks, in order to organize and manage them all, a systematic approach (Automation Framework) is required. 3) What are the different types of files to be created and executed during test automation using QTP Tool? 4) What are the different types of Automation Frameworks available in the industry? i) Record/Playback or Linear Framework (1st generation framework). Note: Framework names also local we can use our own names. 5) What is Record/Playback or Linear Framework? In this approach tests can be created and executed using recording feature. 6) What is Modular Framework? In this approach tests can be created and executed using reusable components. 7) What is Data Driven Framework? i) Maintaining resources is difficult? 8) What is Keyword Driven framework? 9) What is Hybrid Framework? i) Scope is very high as we mix different approaches. ii) Flexible for performing all types of tasks. 10) What are the different types of Tasks to be performed during test automation? we have to analyze the AUT in terms of Object Identification. if the QTP is recognizing all the objects in our application or not. i) Record and playback some End to End Scenarios. 100% test automation is not possible, we can go for maximum automation. i) Using Expert based techniques. 1) Identifying End to End Scenarios. 3) Identifying General and Alternate Flows. 5) Identifying the complex functionality. d) Creating Generic and project specific functions. k) Defect Reporting using Our Company defect management system. 11) What is Keyword Driven Approach? In this approach keywords can be used for creating and executing tests. A reserved word used to identify a specific command or function or method or statement or operator or object etc. 13) What are the important keywords that we use in QTP? 14) What are the Key elements of Automation Framework? 15) What is folder structure? In order to create, store, organize and manage files, a well defined folder structure is required. Folder structure is a mandatory element of any framework, but folder names may vary from one framework to another and company to another. 16) Give an example for Folder structure?